Inept Area 51 employees forget to pay the rent on the facility's off-site storage unit the secret contents are sold to a couple of backwoods rednecks at public auction. 94 backers pledged $2,800 to help bring this project to life. Unit 44 :: Area 51! Conspiracy! Storage Units! Humor! It's STORAGE WARS meets MEN IN BLACK! When an alien invasion threatens the safety of planet Earth, Agents Gibson and Hatch must recover an item from the locker if they hope to stop the extraterrestrial threat. This Kickstarter campaign will fund the creation of the art for issues #2-4 of the sci-fi/humor comic book series UNIT 44. The first issue is complete and now it's time to finish the series! 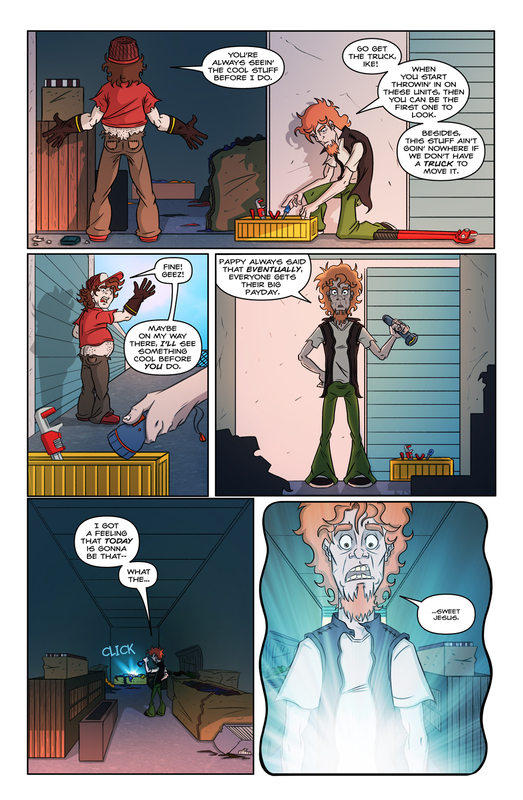 The funds raised will allow artist Eduardo Jimenez to set aside several other projects to focus solely on finishing the comic book for release in Fall 2014. Once complete, the series will be released as a digital-first initiative by ALTERNA COMICS, publisher of the New York Times Bestselling FUBAR zombie anthologies and other fantastic titles including The Chair, The Last West, Metaphase and Billy the Pyro. 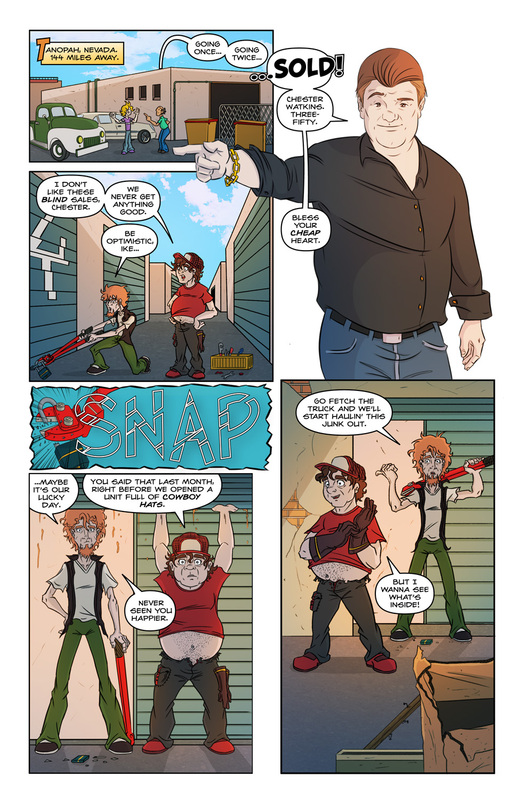 We welcome you to scope out the first seven pages of UNIT 44 Issue #1 below and get a feel for the humorous and wacky tone of the comic! Wes Locher is the writer of the comic books THE UNDOUBTABLES (Markosia Enterprises, 2014), CHAMBERS (Arcana Studio, 2013), the webcomic INNOVATION and the book MUSINGS ON MINUTIAE, a collection of humorous essays. Eduardo Jiménez (Ed!) is a freelance digital illustrator who specializes in comic art, character design and children book illustration. 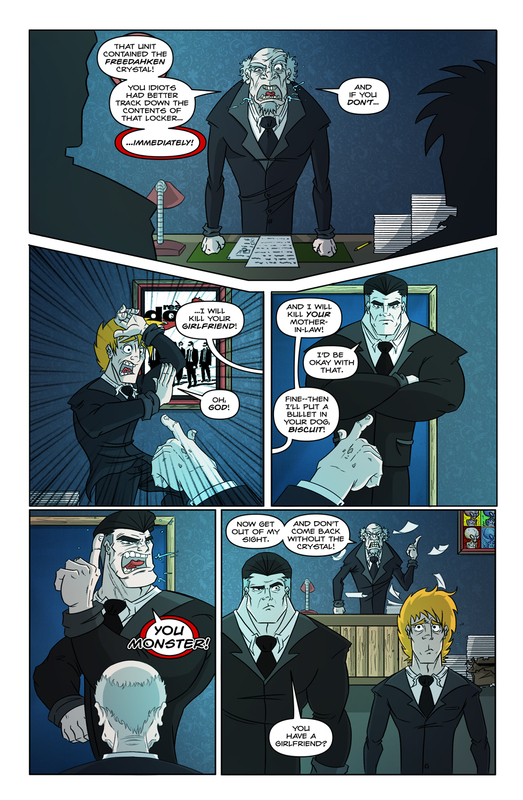 Wes and Ed successfully Kickstarted the first issue of UNIT 44 in September of 2013. They raised $2,700 which allowed them to create the art, print physical copies of the book and fulfill reward creation and worldwide shipping. This campaign is designed to fund issues #2-4 and will keep Ed fed while he works on the remaining 66 pages of the series. Once all issues are complete, the 4-issue miniseries will be published by Alterna Comics as a digital-first initiative available through online retailers like ComiXology. Once they've been released in this format, Wes and Ed will release a 90+ page collected edition, featuring all 4 issues, in print form. The story for UNIT 44 is complete and the scripts have all been written. After funding, series artist Eduardo Jiménez will draw, ink and color the remaining 66 pages which will then be passed back to Wes to be lettered. As long as Eduardo and Wes remain in good health, they anticipate completing the rest of the series by October, 2014, though rest assured that they will work as hard as they can to complete the series sooner. MISSION BRIEFING - Thanks for the support! You're helping to bring our dream to life and we appreciate you more than your high school classmates did. 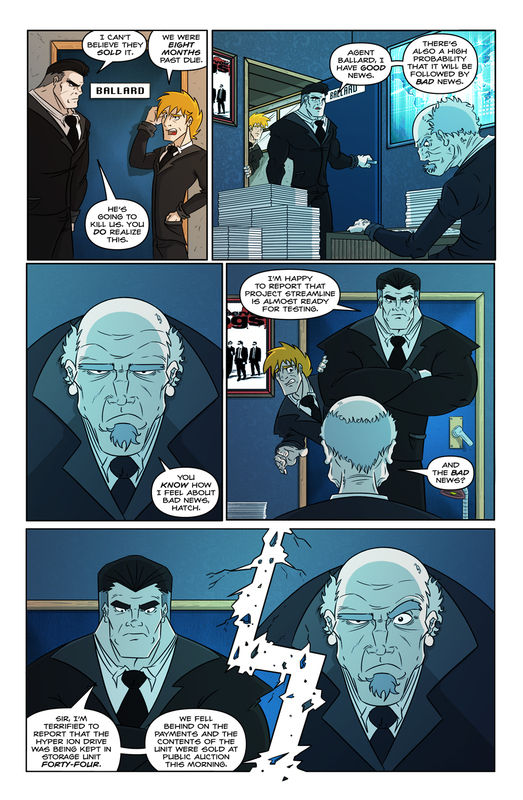 CONFIDENTIAL - Toss us 3 smackaroos and you'll receive a PDF download of UNIT 44 Issue #1 in your email as soon as the campaign ends! It all starts here! HOMECOMING - Geared toward those who backed our initial Kickstarter for UNIT 44 issue #1, this reward will net you a digital PDF download of issue #2 as soon as it's complete! CLASSIFIED - Up the ante a bit and a you'll receive a PDF download of UNIT 44 Issue #1 AND the behind the scenes Issue #1 script book. The script book contains the full script to the inaugural issue, concept art and creator commentary. Both will be delivered digitally as soon as the campaign ends! TOP SECRET - A PDF download of UNIT 44 Issue #1 + script book as soon as the campaign ends. You'll also receive a download of Issue #2 once it's complete! HOMECOMING 2.0 - Geared toward those who backed our initial Kickstarter for UNIT 44 issue #1, this reward will net you digital PDF downloads of issues #2-4 as they're completed. REDACTED - A PDF download of UNIT 44 Issue #1 + script book as soon as the campaign ends. You'll also receive downloads of Issue #2 & #3 as they're completed! RESTRICTED - A PDF download of UNIT 44 Issue #1 + script book as soon as the campaign ends as well as downloads of Issues #2, #3 & #4 as they're completed! You got yourself a digital subscription goin' on! Welcome to the future! SUPER SECRET - You'll nab a digital copy of the UNIT 44 collected edition (minimum of 90 pages) + a download of the original script that Ed used to draw the series! Want to see how comics are made? This is your peek behind the curtain. You'll also receive PDF copies of each issue as they're completed! COVERT - Get a bigger bang for your buck! In addition to getting a PDF download of each issue as it's completed, you'll receive a download of the 88-page UNIT 44 collected edition + a download of the original series script AND a download of Wes' 88-page crime-fiction graphic novel, CHAMBERS. That's over 260 pages of stuff for your eyeballs. Who loves comics? YOU love comics! INCOGNITO - In addition to getting PDF downloads of each issue as they're completed, you'll receive a download of the 90+ page UNIT 44 collected edition + a download of the original series script, AND downloads of Wes' 88-page crime-fiction graphic novel, CHAMBERS + a PDF copy of Wes' 160-page humor book, MUSINGS ON MINUTIAE. That's over 400 pages of stuff to keep your brain entertained. Can you handle it? UNDERCOVER - Digital overload! 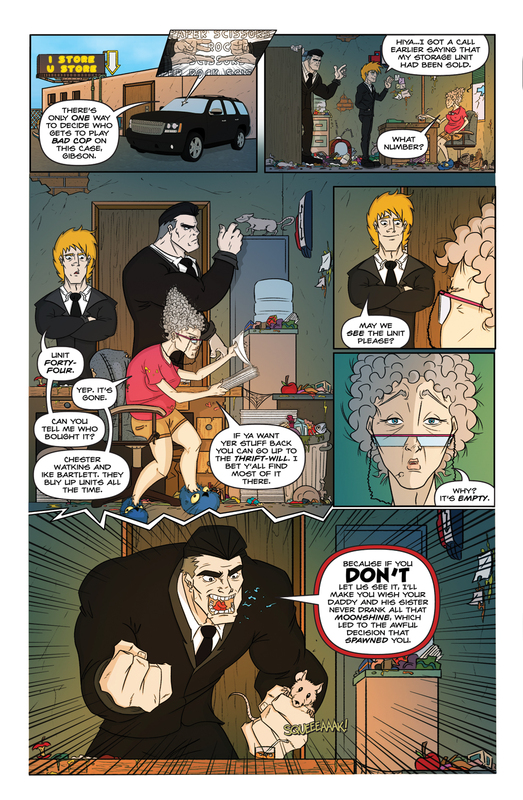 In addition to getting PDF downloads of each issue as they're completed, you'll receive downloads of the 90+ page UNIT 44 collected edition, the original series script, Wes' 88-page crime-fiction graphic novel, CHAMBERS, his 160-page humor book, MUSINGS ON MINUTIAE, and you'll ALSO get a PDF of Wes' 96-page heist graphic novel THE UNDOUBTABLES. More than 500 pages of comics goodness comin' at ya! AREA 51 - Hey, writers -- In addition to scoring a digital copy of the 90+ page UNIT 44 collected edition + a download of the original series script, writer Wes Locher will read your comic book script or short story (up to 24 pages in length) and provide helpful feedback to make it even more awesome! You'll also get PDF copies of Wes' books CHAMBERS, THE UNDOUBTABLES & MUSINGS ON MINUTIAE. WATERTOWN - Hey, art lovers -- In addition to scoring a digital copy of the 90+ page UNIT 44 collected edition + a download of the original series script, Unit 44 artist Eduardo Jimenez will draw the pop culture character of your choice and email you the hi-resolution file! You want a Han? A Walter White? A Wolverine? A pic of your own mug? He has you covered. You'll also get PDF copies of Wes' books CHAMBERS, THE UNDOUBTABLES & MUSINGS ON MINUTIAE. 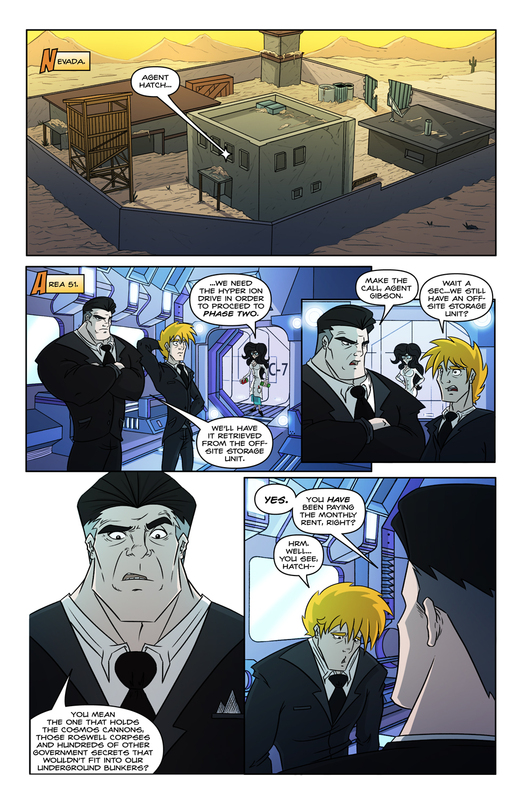 GROOM LAKE - You'll appear as a background character in the third or fourth issue of UNIT 44! You'll be recognized in the credits for your contribution and you'll receive PDF copies of the collected edition, the original script and we'll email you each issue as it's complete! This level also comes with downloads of Wes' other books, CHAMBERS, THE UNDOUBTABLES & MUSINGS ON MINUTIAE. PARADISE RANCH - Your likeness will appear in a speaking role in the third or fourth issue of UNIT 44! You'll be recognized in the credits for your contribution and you'll receive PDF copies of the collected edition and the original script. Plus, we'll email you each issue as it's complete! This level also comes with downloads of Wes' other books, CHAMBERS, THE UNDOUBTABLES & MUSINGS ON MINUTIAE. HOMEY AIRPORT - *Back by popular demand! * Your likeness will appear in a speaking role in the fourth issue of UNIT 44! You'll be recognized in the credits for your contribution and you'll receive PDF copies of the collected edition and the original script. Plus, we'll email you each issue as it's complete! This level also comes with downloads of Wes' other books, CHAMBERS, THE UNDOUBTABLES & MUSINGS ON MINUTIAE. 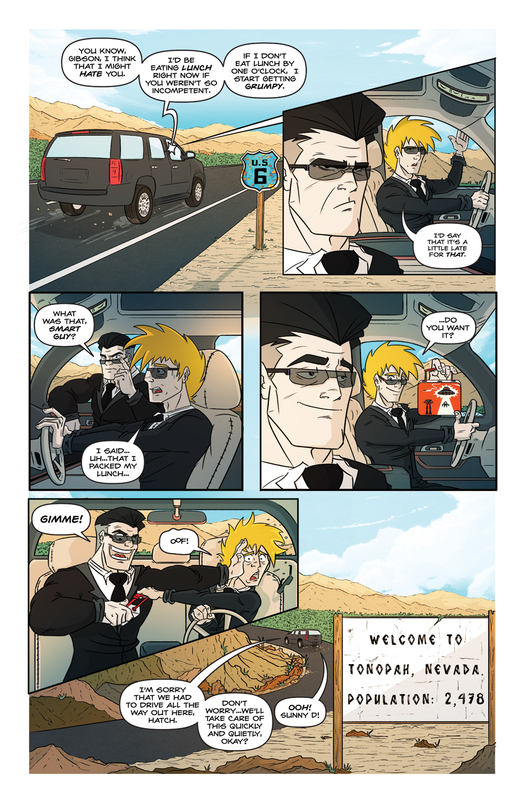 DREAMLAND - One lucky backer will appear as a secret agent in the third issue of UNIT 44! You'll directly interact with the main characters, Gibson and Hatch, and have several lines of dialogue! In addition, the character will be named after you and you'll be recognized in the credits for your contribution. You'll receive PDF copies of the collected edition and the original script and we'll email you each issue as it's complete! This level also comes with downloads of Wes' other books, CHAMBERS, THE UNDOUBTABLES & MUSINGS ON MINUTIAE.